The production opens with some sweet water color paintings (done by Alex Ross) that recap the first film. Viewing Spider-Man (the first movie) isn't a prerequisite, but I'd suggest it. (In fact, I'd wished I'd re-watched it). There are several threads that continue here and you may be a bit confused for a while about some of them. Still, the filmmakers have outdone themselves with this sequel. I absolutely loved the first half of the first movie: the self-discovery, Peter Parker's getting to know himself as Spider-Man, the swinging. It was the overblown villain of that film's second half that I didn't like. As soon as Spider-Man started fighting him, the film just got silly. In "2," they've found a new angle on introspection: "Can Peter and Spider-Man live together in the same person?" "What of the dreams Peter Parker must sacrifice -- is that fair?" This is the internal struggle. And it's a good enough one to base the entire film on; in fact, this episode's super-villain (who's easier to enjoy anyway) takes a back seat to that conflict. Further, instead of breaking the film in half (first part inner struggle, second part fight the super-bad-guy), "2" chops those threads up and weaves them together like err, well, a web. The love story is the third thread. Atop this juicy plot-blueprint, throw in seat rumbling special effects, really good acting, great casting, a driving pace, splendid cinematography, strong score, strong direction and you've got a film with some serious entertainment impact. The only areas for improvement (and these are minor flaws): The film strikes the comedic "Peter Parker is a dweeb" cheap site-gag a few too many times. And, though probably necessary, the characters occasionally speak important lines to themselves. This feels just a bit awkward, as regular people would normally just "think" those lines, not say them out loud for an audience's benefit. But boy, I just love the downtown trapeze, cityscape swinging scenes. The CGI has greatly improved from the first time around (which I loved -- even in its imperfection). The motion capture, inertia, weight and feel of this "monkey" like spider are fantastic. Add in a "flying" camera, and these scenes give you the feel of being inside them, of swinging from skyscraper to skyscraper yourself. A truly immersive experience. "Spider-Man 2" is an easy A film. Very nearly "A+." Incidentally, This is a New York film. Peter Parker has moved from his Aunt's home (in Queens) to a Manhattan apartment. Spider-Man 2. Copyright © 2004. Rated PG-13. 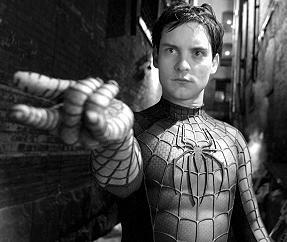 Starring Tobey Maguire, Kirsten Dunst, James Franco, Alfred Molina, Rosemary Harris, J.K. Simmons. Donna Murphy. Directed by Sam Raimi. Screenplay by Alvin Sargent. Screen Story by Alfred Gough and Miles Millar and Michael Chabon. Produced by Laura Ziskin and Avi Arad at Columbia/Marvel. (c) 2004.